Drilling and driving screws are the most common DIY tasks for Weekend Warriors. Whether replacing batteries in a child’s toy, assembling flat-pack furniture, fixing a hinge, hanging a picture frame or building a project, it’s likely that you’ve needed a drill or driver to get the job done. We’re covering the different types of drills and drivers with their uses to help you to choose the right tool for your next DIY project. As the name suggests, these tools are used to drive or loosen screws. Powered Screwdrivers for DIYers are commonly small cordless tools that allow you to tighten or remove light duty fasteners, perfect for assembling flat-pack furniture or fixing a loose hinge. Handy Tip: These tools are intended to drive screws when a pilot or threaded hole has been pre-drilled as they’ve got lower torque and rpm (revolutions per minute) than larger drill drivers. Drilling small pilot holes first before driving in the screw will help you bring your project together. Like screwdrivers, Drill Drivers can be used to drive or loosen screws but also have the added feature of being able to drill holes with their increased torque and rpm. 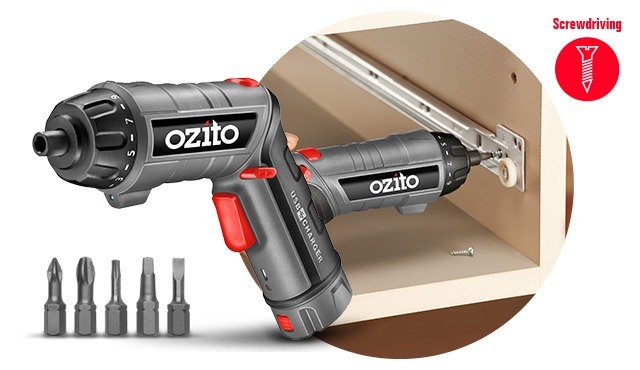 By inserting a drill or driver bit to the adjustable chuck, you can setup your drill for many different tasks including drilling holes in timber, plastic or metal, fixing a picture frame to a wall or assembling a DIY project. Handy Tip: As a general rule for drilling and driving, the lower the speed is, the higher the torque will be, great for driving larger screws. A Hammer Drill features an internal gear that pushes the chuck forward and back, which thrusts the drill bit into tough surfaces while drilling. 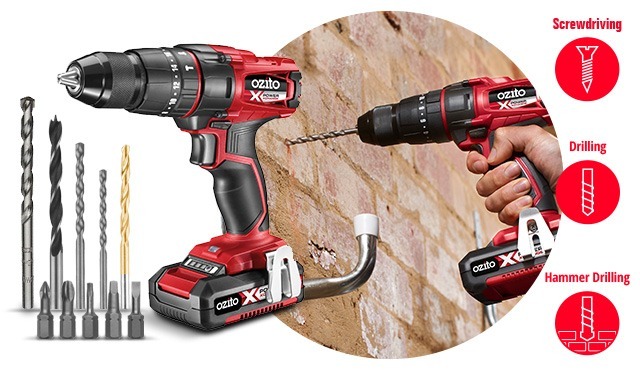 This action provides the ability to drill holes in masonry surfaces such as brick and concrete, perfect for when you need to mount a shelf or hose reel into a brick wall. 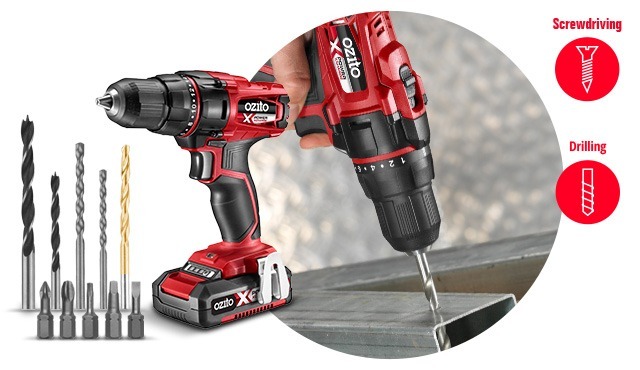 Both electric and cordless variants will most likely include settings to switch between screwdriving, drilling & hammer drilling modes. Handy Tip: When working with masonry, Hammer Drills are most effective at high speeds so be sure to depress the speed trigger all the way while drilling and clear the holes regularly from debris. 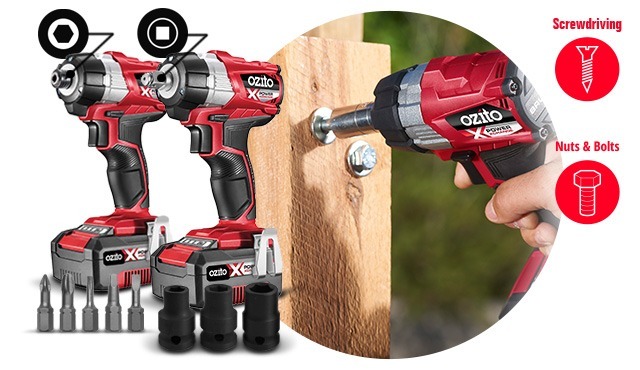 These power packed tools are usually a combination of drill types all in one unit so you can drill into most materials like timber, plastic, metal with the drilling mode & masonry using the hammer drilling function. 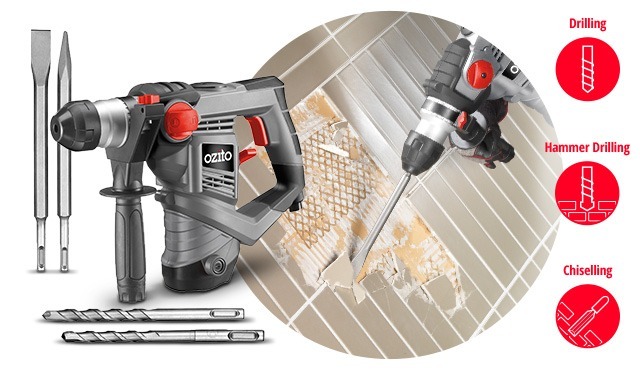 Most Rotary Hammer Drills will not include a screwdriving mode but will feature a chiselling function which stops the rotation of the connected accessory and only pulses in and out. This mode is ideal if you are removing wall or floor tiles or chipping away cement in your backyard. Handy Tip: Rotary Hammer Drills are specifically designed for masonry materials so don’t need to be run at high speeds because of the unique hammer action driving the drill or chisel bit into the masonry. Impact Drivers are basically heavy-duty screwdrivers. They use a rotating weight to help push the chuck around allowing them to not only tighten and loosen larger screws but also tougher nuts and bolts. The chuck shape at the end of the tool determines if it is a Driver or Wrench. Impact Drivers will have a ¼” hex connection (‘⬢’) for inserting common driver bits with a hex shank, whereas Impact Wrenches will use a ½” shaft (‘◼’) allowing the fitment of sockets that are perfect for automotive jobs. Handy Tip: Impact Drivers and Wrenches take much of the muscle strain out of DIY projects with large screws and bolts, or when driving lots of screws like when laying a timber deck. Now you’ve got a better understanding of the different types of drills and drivers, we hope you’ll find it easier to choose the right drill to tackle your next DIY project.